International Cold Storage Inc. is a warehouse company who specializes in storage of food products in a temperature-controlled environment, which varies between 4° and –32° Celsius. 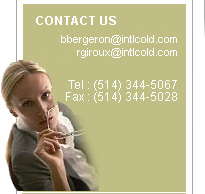 Mr. Benoit Bergeron founded the company in 1994. The company’s operations began in a rented warehouse facility situated on Ferrier Street in Montreal. A few months later the business evolved and required more warehousing space at which time the company moved to Fisher Street. In 2002, the business increased again, operating 57% of the warehouse space on Fisher. In the beginning of 2005, in response to our customers needs, the company opened a second facility in Toronto. This new warehouse offers the same services as in Montreal and is situated at 3691 Weston Road in Toronto. In the summer of 2005 began the plans to build a warehouse on the Island of Montreal, which would have a storage capacity of 20,000 pallet positions. In August 2006, the project was launched and the construction work began. This new facility is one of the most modern in Quebec, approved by the Canadian Food Inspection Agency (C.F.I.A. ), will be in full operation on June 1st, 2007. We will be offering the same services and more. Exports - from preparation of the products up to and including the export documentation. Imports - under the supervision of the C.F.I.A. Freezing for Trichinosis control aided by a quality system, which provides fast and accurate results. Transport service for containers and refrigerated reefers. his new warehouse is situated on the service road of highway 40 north, at the Poirier Street intersection. The address is 8155 Trans-Canada Highway in Saint-Laurent. Copyright © 2009 Entrepôt Frigorifique Inc.